Interflora is Denmark’s biggest player in the flower market and at the same time Interflora is setting the trend for E-commerce with interflora.dk as the big digital store filled with flowers and other gifts. Now flowers are also something that you can subscribe to. In 2016, Interflora introduced its first subscription business, Posy.dk, and in April 2017, Interflora launched its first subscription concepts on interflora.dk – developed in collaboration with Subscrybe. 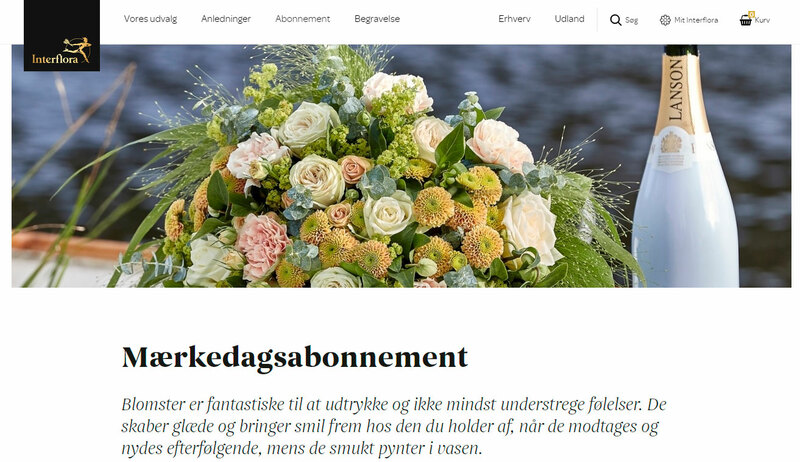 For Interflora the subscription dedication was motivated by a desire to create an even closer connection to its customers and get them to shop even more on interflora.dk. However, it was also important for Interflora to create a subscription concept that was innovative, creative and delivered more value to the subscribers. This was the task that Subsrybe had to solve together with Interflora. The solution became the concept “Anniversary subscription”, which contains three new subscriptions at Interflora. With the packaging “My personal anniversaries”, the customer is able to combine his or her personal anniversaries, e.g. a wedding anniversary or mother’s birthday. Other subscriptions at Interflora are “World’s greatest mom” and “Love”. The next step is to launch a subscription at home, in which the customers can get beautiful flowers delivered to their home address continuously. The new subscriptions were created through a thorough innovation process, which among other elements contained:. With the new concepts, Interflora has taken the leap into the subscription economy while they have made it easy, fast and convenient for their customers, who never have to find an excuse to a forgotten anniversary. “I have had the pleasure to work with Subscrybe in developing Interflora’s subscription model. During the whole process, the Subscrybe team has been great in challenging my organisation and me professionally, and at the same time they have been open to changes and acted on the established knowledge. They work in a structured manner and are amazing to collaborate with. Read more about Interflora’s new subscriptions here. If you would like to learn more about this case, please contact CEO Morten Suhr Hansen by telephone + 40 29 45 34.